We know it’s hard to decide between several products. Email us at hello@thedetoxmarket.com and our Green Beauty Experts will be happy to help you find what’s best for you! Unfortunately, we do not offer gift wrapping with online orders. At this time, gift wrapping is only available in-store. Please note that samples are surprise gifts and can't be chosen. If you need something shipped internationally, please place an order through our U.S. site. We offer free Canada Post shipping for all US orders above $100 (after discount, gift cards, and before taxes). What is the shipping rate for deliveries within Canada? All orders under $100 shipped within Canada have a flat rate fee of $8.99. Packages are shipped within 2 business days of order receipt using Canada Post. Your package will arrive within 2-9 business days after it leaves our warehouse. *There are no international orders shipped outside of Canada at this time. We accept shipping to PO Box addresses via Canada Post. When your order arrives, please inspect the carton for any damage that may have occurred during the shipping process. It is normal for the outer carton to show some wear and tear; however, if there is damage to the item(s) in your shipment, you can quickly process a return and The Detox Market will email you a prepaid shipping label to return the item(s). You can also call us at +1 (323) 782-0421, Monday through Friday, 10AM to 6PM Pacific Time, or email hello@thedetoxmarket.com and our team will assist you. Please provide your order number when you call or email, and retain the shipping box, packaging materials and damaged items. 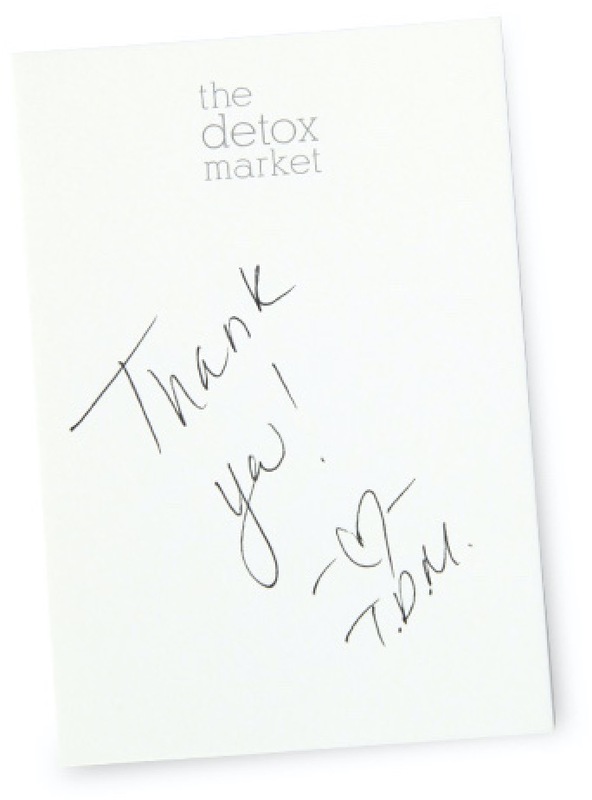 For customer service concerns, please email us at hello@thedetoxmarket.com or call +1 (323) 782-0421. We will do whatever we can to solve your problem quickly and efficiently. If this is regarding a return, please refer to our Return Policy and our Return Page. *For sanitary reasons the following products are FINAL SALE: ALL face and body tools, including- cleansing sponges, makeup sponges, makeup brushes, mask brushes, face cloths, gua sha tools, dry brushes, face rollers, as well as water bottles and towels. For sanitary reasons, the following products are FINAL SALE: ALL face and body tools, including- cleansing sponges, makeup sponges, makeup brushes, mask brushes, face cloths, gua sha tools, dry brushes, face rollers, as well as water bottles and towels. The Detox Box ships the first week of each month via Canada Post, or as soon as it's ordered while supplies last. You’ll always receive an email confirmation with your tracking information. Your card will first be charged when you initially sign up for a subscription. For month to month subscriptions, your card will then be charged on the 3rd of each subsequent month. For 3 and 6-month subscriptions, your card will then be charged on the 3rd of the month every 3 or 6 months, respectively. Unfortunately, The Detox Box can only be shipped within Canada at this time. The Detox Box ships the first week of each month via Canada Post, or as soon as it's ordered while supplies last. The Detox Box ships monthly, so please be advised your gift may take up to 4 weeks to be delivered. You’ll always receive an email confirmation with your tracking information.